In the two months that I have been your Interim Rector, I have been delighted and impressed with the many things that have already been accomplished here, by members, the staff, Vestry, and especially the Wardens. We have beautiful new offices. Many repairs and improvements to the grounds are underway or completed, and most importantly, the search process is running smoothly and effectively. Much of this has been accomplished by your generous gifts of time – thousands of hours, I am told – as well as your contributions. Churches in transition have a great number of new things asking for their attention related to the calling of a new Rector, but the day to day concerns of being a church don’t go away either. This can make for anxious times for both leadership and members, as we both wonder and decide what the future will bring. It is therefore all the more important that we pray for and support one another during this interim period. Father George was the leader of this parish for such a long time that it will take the efforts and the wisdom of all of us to fill the gap left by his absence. The good news is that this has been happening in amazing ways. Even as the Vestry listened to your voices, and has St. Edmund’s living within its means, core church programs have been maintained, many improvements have been made to the buildings and grounds, space use has been effectively reorganized, and people have stepped into vital ministries like pastoral care, to the great benefit of the parish. While living within our means is basic to good stewardship, I have heard from many of you about your dreams for the future of St. Edmund’s. More engagement with our community, more educational and music programs, effective outreach to our neighbors and to the larger world, and, of course, the growth of the St. Edmund’s family. You also have expressed the desire to insure our future by making sure we have the resources to maintain and improve our facilities. And if we want to realize all of those worthwhile dreams while living within our means, we have to increase our means. 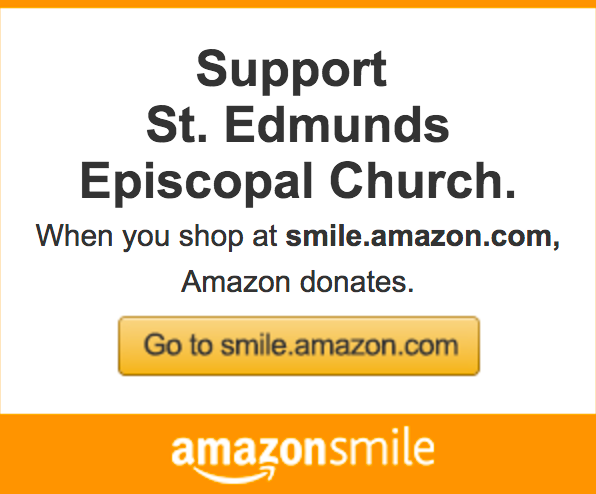 If we have more, we can do more for both the present and the future of St. Edmund’s. It frequently happens during a transition period that parish giving decreases quite a bit more than whatever decline may have been the pattern. This is, perhaps, understandable – people often adopt a “wait and see” attitude during anxious times. But I would like to say, as Jesus says so often in the Gospels, do not be anxious. This is a parish with great reason to be hopeful instead of fearful. In addition to the tremendous wealth you hold in your buildings and artworks, your location and your history, you have an even greater wealth of experience, amazing lay leadership, hospitality in your corporate DNA, and, in my brief experience of you, energy to change and grow. And, of course, your next rector will be a key part of realizing your hopes and dreams for the parish. In order to attract gifted, enthusiastic candidates to make a commitment to the future of the parish, it is very important that the congregation also makes a commitment. Increasing your pledge, and the changes that will become possible with that increase, will be a tangible sign of that commitment, and will make St. Edmund’s more attractive to the candidates with the gifts and passion to help you realize your aspirations. So I hope you will pray hard before you make your pledge this year. I hope you will pray for St. Edmund’s members, lay leaders and clergy, and in those prayers dream a little about what this community and its future might be. Place your hopes for St. Edmund’s before God, and then prayerfully ask what you are able to contribute in time, treasure and talent to make those hopes become real. After your prayerful consideration, please respond promptly. We hope to hear back from everyone by November 30 so that we can begin planning for the future. If you can be generous, we can do wonders.